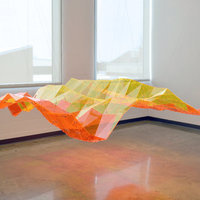 Artist’s Talk, Stephen Cartwright, Associate Professor, School of Art + Design, University of Illinois Urbana Champaign. Image: Stephen Cartwright. Mesh (Human Powered Outdoor Activity 2015), 2018. Acrylic, hardware (24 x 107 x75 in. ).